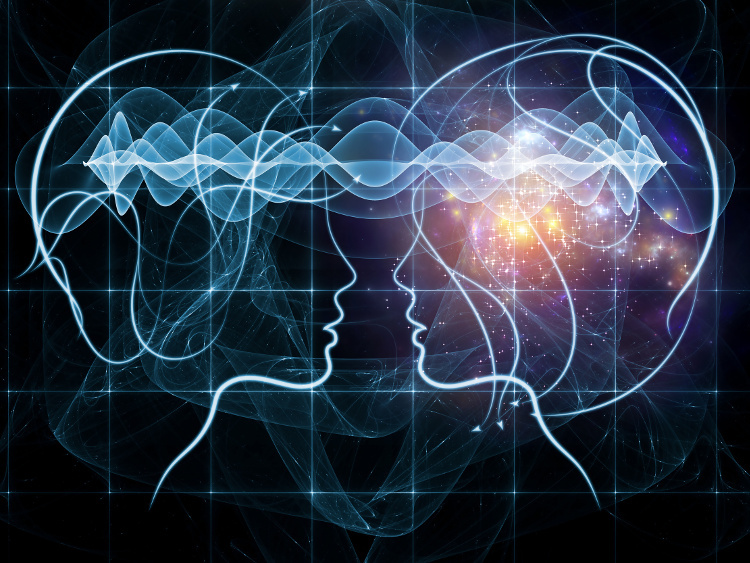 My work derives from the self-imposed question: How would the world be like, if we were able to see it from different positions in time and / or space simultaneously ? The result is not an image of something, but is itself a four-dimensional space-time bubble and the viewer himself can and has to move himself through this maze of a virtual-real object. Or he may simply be fascinated. There is a area "Recently" existing on this page showing and discussing actual works every Wednesday. The series Beginning. This is the classical series, here some older chrono-chorotic pictures are shown. The highlight. 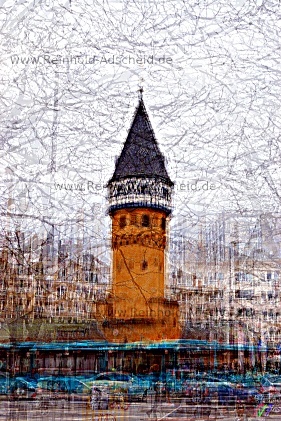 Chrono-chorotic images from Germany's cities. This series shows rotationally symmetrical motifs from human hands. 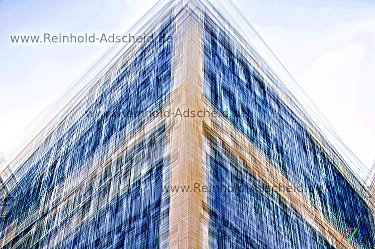 All images in this series are taken in the early morning on the Breslauer Platz in Cologne. Here you will find images of nature. 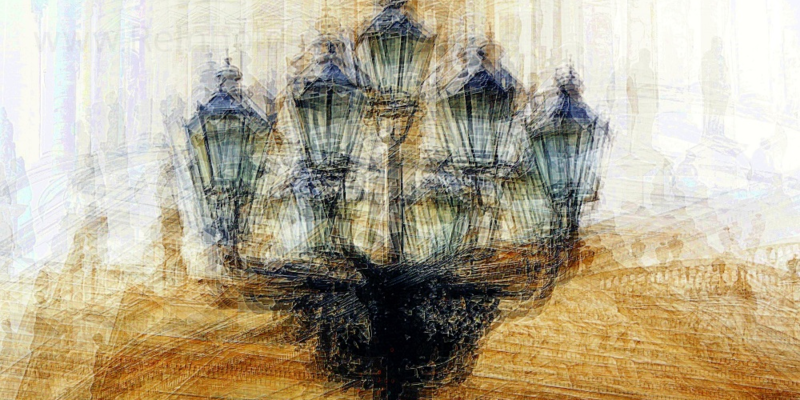 These images are often described as impressionistic. This series shows the people in haste or in restlessness. This series shows carriages or horses, but in any case in motion. Here again the Nighthawks/25 from the Discovery Art Fair 2019. Background this Series is the deepseafrogfish. Inspired by an artistic depiction of such a fish, to which the artist had given a blue luminescence. The sight of this blue fish in the black deep sea has moved me a lot. And shortly thereafter, on a daily drive, I passed a petrol station. Everything suddenly fell to one, in its place: gas stations work like deep-sea fishing fish. 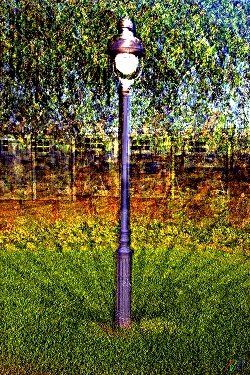 They do not move but wait and they lure us with light. In addition, many more aspects and analogies are still present. The plan was born fast: filling stations, gas stations without people, petrol stations around, gas stations at night, gas stations in static, parallel lines. I drove around for a month and had lonely gas stations at an hour later - And visited. 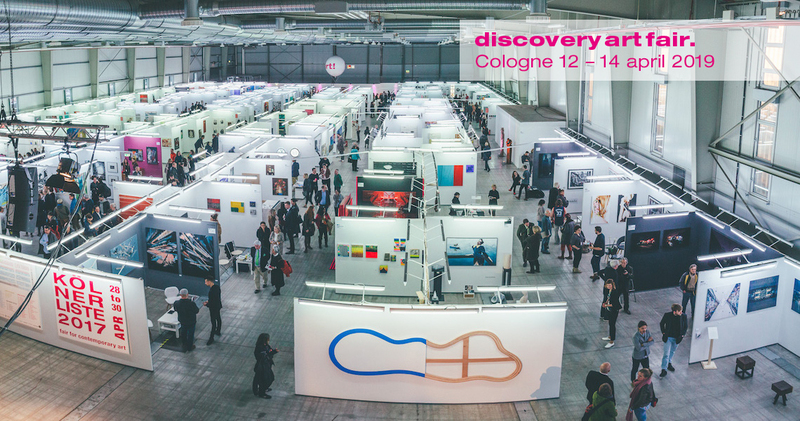 A big THANK YOU to all collector and buyers of my art, which made the Discovery Art Fair a successful start into 2019! 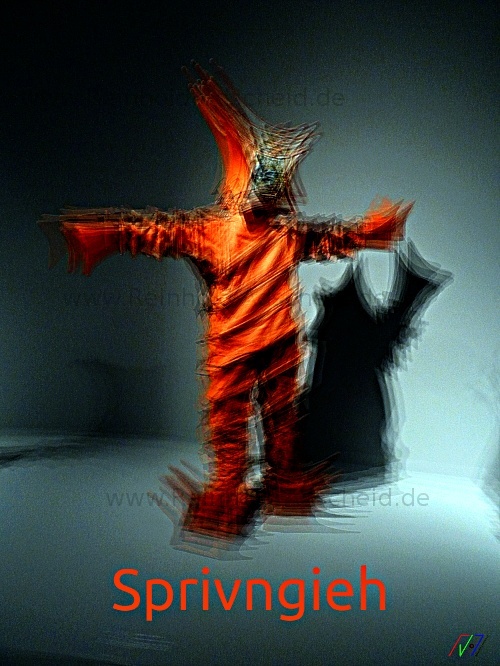 Ausstellungen. 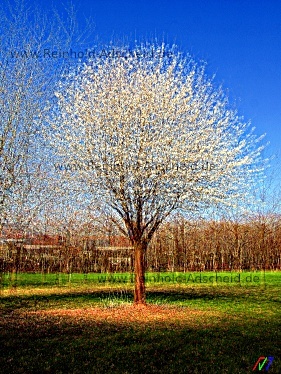 Spring appears and the cherry shows its soft white flowers. Bäume. 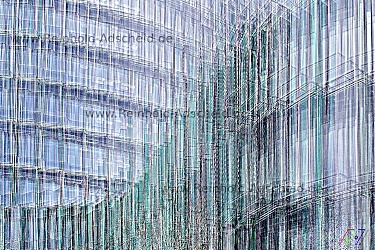 Seen from the palm garden, the lines of the building appear like the ups and downs of the stocks... Frankfurt. 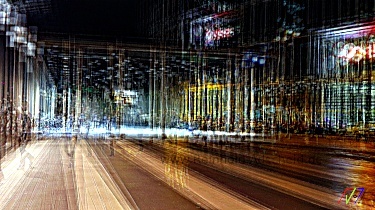 Because of a studiovisit I have been asked about pictures from Hamburg. Yes, do I have! But not yet in the WEB. So I selected some pictures! Have a look! Hamburg. Be tuned. Come back later to see more! In Cologne there is a long tradition of Heinzelmännchen. Everyone is looking for them, and the legend tells them that they were driven out by exactly this search. This narrative image of the Wroclaw square shows a well-attended place despite the late hour, which gives with its temple and the ghosts hope that the Heinzelmännchen are still to be found. Köln. 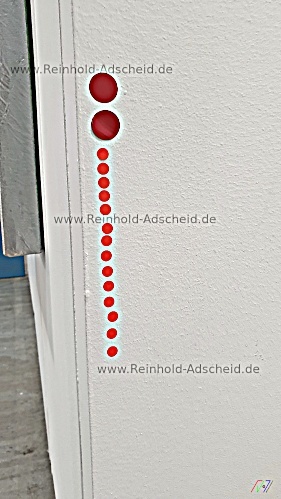 Lighthouses work only if they can be seen from anywhere, but Reinhold Adscheid has a shoe made of the same: The world from the point of view of the lighthouse shows itself in its, the lighthouse, timeless perception. 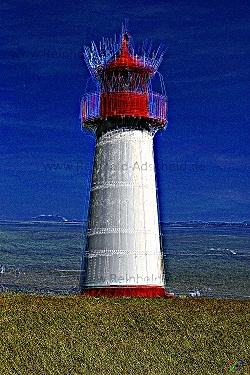 Look around from time to time, I travel across Europe again and again to capture spectacular images of lighthouses. Lighthouses. Strom Invitation for exhibition Ausstellung Strom. I am very proud to show one work of mine in the exhibition "Strom" in Hilden, Germany. "Stromengel/17" from 2013 has only been on show one time, but I got huge amount of feedback on it. I hope, there is also a lot of interest on this exhibition in Hilden! Or is it a fish? A fish with tinsel? Calatrava/10. What can be "Lanternized"? 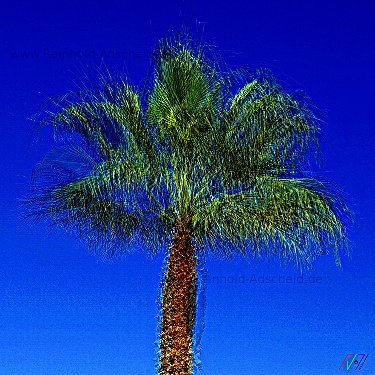 Why not even a palmtree? Here is a particularly beautiful one. It is located in Valencia, more precisely at the sports boat harbor, right on the "Platja Del Cabanyal". Zwergpalme/7. 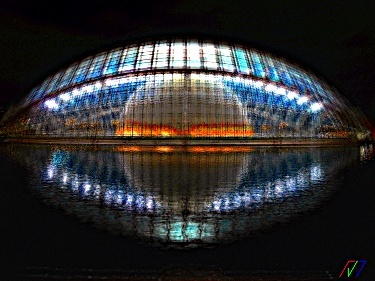 Blue Eye/18 This building in Valencia, called Hemisfèric, brought to this world by the creativity of Santiago Calatrava, does not look like this until evening. And also only from the outside! 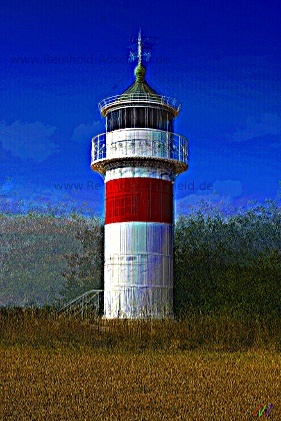 My new passion: lighthouses. Here are the first versions of new, fascinating images to be found. 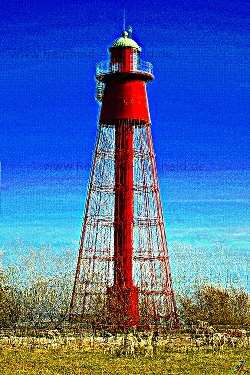 The beginning is made by an unusual lighthouse from Öland: Kapelludden/6. Nachtschwärmer/25 My work Nachtschwärmer/25 (Nighthawks/25) is one of a total of 84 exhibits in the exhibition on the occasion of the 30th anniversary of the Kontrastlab. Is on until 31.10. A new series in my portfolio: Sylt. Some pictures are already listed, but still some will be added in the near future. My fund on unprocessed images is still quite large! Rotes Kliff/21. Springvieh A snapshot. And inspiration for a new series? 140517/17-1 Santiago Calatrava has been supposedly inspired by a reclining woman to the design of main station from Liege. Here you can see the exit from the main building to one of the platforms. The roof flows seamlessly down and shows a continuous form. Do you recognize the rolling stairs? Kina Slott/9 Another royal lantern. This time one from Stockholm, more precisely, from Drottningholm. 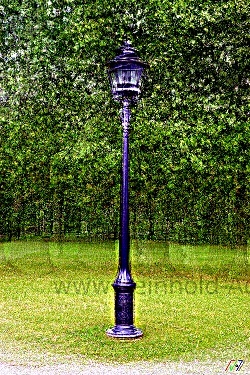 In the park are countless of these lanterns, but this here is in the immediate vicinity of a "Kina Slott" called building. Cologne, Subway: Wie räuhich ett ungen ess.../8. Faydance/8 This time a picture, which can act and which shall act then without any words! 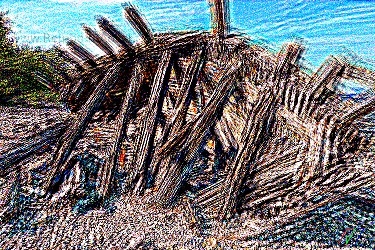 Sweden, Öland, Trollskog: Schiffswrack/19. In the far north of Öland, this wreck lies on the beach. It's been there for at least 60 years. And so has already become for generations of visitors to a sharp point, not only for a holiday but also for events with their children in connection with holidays on Öland. Any visitor to the island knows this ship called Swix. And that it has sunk in a storm 90 years ago, had been lying for 30 years on a sandbar far off the island and was driven by another storm on the beach at Trollskog. 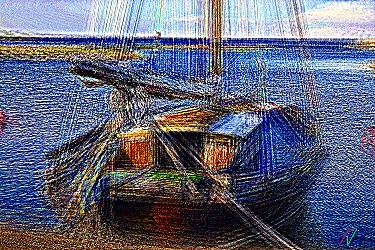 Sweden, Baltic Sea, Harbour: Holzsegelschiff/43. Here is a picture of the new series in development. 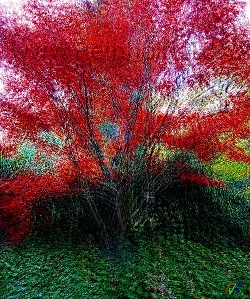 This image consists of 43 individual photographies, a rare stroke of luck. This day is my Birthday: 141130/11-1. And that's why I show you today another previously unpublished image from the Heumarkt Cathedral! 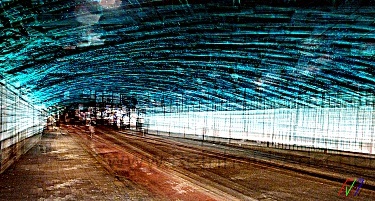 The trainstop at the lowest level has large light surfaces made of glass bricks. Here are eleven of these surfaces put together to form one picture. This number eleven can be found in Cologne again and again. And I will show eleven stairs, or even eleven light surfaces. Cologne, Central Station: Eigelstein/9. Due to recent events I show today an image from the series HBF blue. The Greek Dimitris Manolas operates the site "The Vanderbild" and has featured my pictures just today. My pictures are shown anytime anywhere in the world by any blog, but this site is just not like the other monotony mash. What does my picture Eigelstein/9 show? 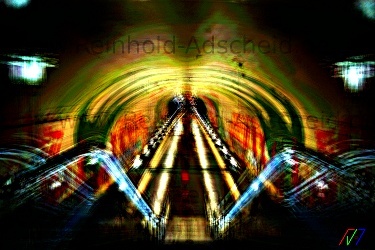 It is the passage of the road Eigelstein under the tracks of the Central Station. For dove defense all these bridges in the immediate and wider environment of the central station are illuminated by this turquoise light. I have featured all these shades of blue in the area of the station and made a small series of it. All images have been created at 6:30 in the morning. All images have been taken right next to the Central Station. Gas stations: Nachtschwärmer/25-1. Gas stations at night. Who cannot tell a story concerning a gas station.
. 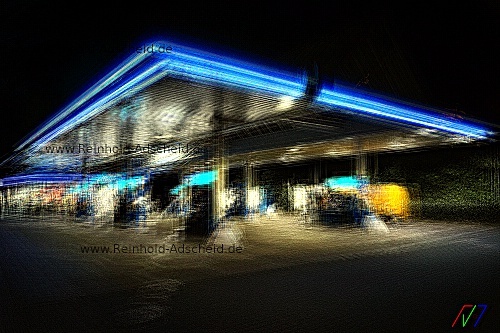 Since I have been showing my gas stations I've heard many, many stories where gas stations played an important role. Put one of the gas stations on your wall and listen to the stories of your visitors! City, Underground: 140830/38. Light! 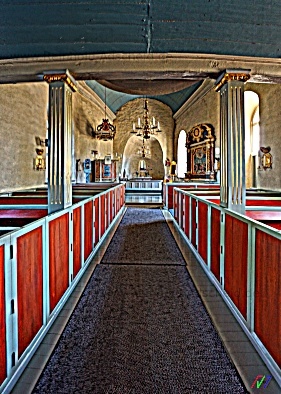 What incredible effects can be produced even in secular buildings! Near the ocean, on the beach: Schiffswrack/19. This time, a ship, and again one that is not in the water. But today it is a wreck on the beach. And you will be surprised: This image will be part of a special edition, an exclusive edition with only a few pieces and each image is a serial unique! This page was changed last on 16.04.2019 08:32 .